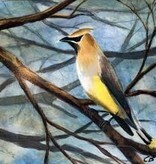 A treat to find in your binocular view field, the cedar waxwing is a silky, shiny collection of brown, gray, and lemon-yellow, accented with a subdued crest, rakish black mask, and brilliant-red wax droplets on the wing feathers. In fall these birds gather by the hundreds to eat berries, filling the air with their high, thin, whistles. In summer you’re as likely to find them flitting about over rivers in pursuit of flying insects, where they show off dazzling aeronautics for a forest bird.